Washington Post opinion writer Paul Waldman says despite a bad week the odds of impeaching Trump are still long. 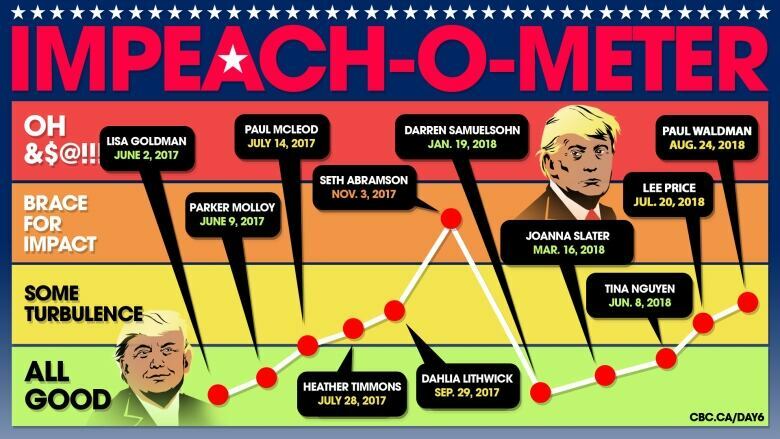 When Donald Trump generates headlines, Day 6 fires up the "Impeach-O-Meter," inviting political experts to estimate the odds his presidency will end in impeachment. These are, of course, subjective and hypothetical scores and the impeachment process is complex and dependent on many factors. It was quite a week for U.S. President Donald Trump. On Tuesday, the president's former campaign manager, Paul Manafort, was found guilty on eight counts of financial crimes, including bank and tax fraud. Minutes later, his personal lawyer, Michael Cohen, pleaded guilty to eight charges, including campaign finance violations. Cohen then added that Trump directed him to pay $130,000 US to adult film star Stephanie Clifford, better known as Stormy Daniels, in order to effect the outcome of the 2016 presidential election. There's been impeachment talk this week on Capitol Hill as Democrats look toward the midterm elections — and the hope of re-taking control of the House of Representatives — with optimism. Speaking about the possibility of impeachment during a Thursday interview on Fox News, Trump said, "I don't know how you can impeach somebody who's done a great job." In light of the week's events, we turned to Washington Post opinion writer Paul Waldman to see how much the needle has shifted on the Day 6 Impeach-O-Meter. Every few weeks, we check in on the odds of U.S. President Donald Trump being impeached, from one, meaning totally safe in the White House, to 100, meaning impeachment is imminent. When we last checked in, Lee Price, a spokesperson for Irish betting house Paddy Power put the odds of impeachment at 33 per cent — a 13 per cent increase over the previous prediction. "People around him are falling like flies. His former campaign manager, his former personal attorney, are both, it looks like, perhaps going to jail. And Michael Cohen implicated him in at least a couple of crimes, which he may or may not be guilty of. But the other thing you have to really consider is what would it take for him to be impeached? The first thing that would be required is for the House of Representatives to decide to impeach him. Right now there is a majority of Republicans in the House of Representatives. Democrats may take the House back in November's elections. The real tough part though comes in the second part of that process because the Senate would then have a trial. And to get convicted in that trial, the president has to have 67 senators — two-thirds of the body — vote to convict him. Right now, there are only 49 Democrats in the Senate. Even after this year's election, if they have a fantastic election, it might be 51 at most. It's awfully tough to see how you're going to get 16 Republicans to vote to convict him, even if he's found to be a serial killer." So where does Waldman place the probability of a Donald Trump impeachment this week? That marks an increase of two per cent over our last prediction. We'll continue to track the numbers in the weeks to come and you can follow along here. To hear Paul Waldman give his Impeach-O-Meter prediction, download our podcast or click the 'Listen' button at the top of this page. How did Logan Paul's redemption tour lead to a boxing match between YouTube bros?